All sorts of enterprises need records stored, and for well over half a century, secure storage has been the raison d'être of Iron Mountain. The company has, in that timespan, developed a gigantic client base from across a broad and diverse range of industries. But despite most of its business relationships running like clockwork, Iron Mountain found itself running into a problem; a particular kind of client Iron Mountain worked with had very specific requirements to keep doing business. Iron Mountain had a growing roster of Federal Government clients but the constantly-evolving regulatory demands were making the task next to impossible to manage. And operating on a scale like Iron Mountain does, it's not a matter of just a few contracts with a few agencies to sort through. "[Before SpringCM] everything was done via email and Sharepoint," said Greg Swennumson, director of federal contracts, federal business unit, Iron Mountain. "When the business unit was smaller, that worked, but as the business scaled it became impossible to keep track of emails and versions and servers. It was painfully obvious that we couldn’t run the business before putting in a genuine contract database." And so Iron Mountain's goal was two-tiered. The company needed to find a contract management solution that would meet the compliance burden so that they could continue providing service to their federal clients. But no less important was their need to replace bulky manual processes with efficient, streamlined ones. So Iron Mountain began the search for a contract management solution that would give the federal division top-notch security and a much-needed operational upgrade. The ideal solution that Iron Mountain's federal division was looking for was one that, of course, hit the benchmarks for security that the Federal Government demands. But then there was the question of doing business better – and for Iron Mountain, that meant a need for the kind of next-gen contracting tools. Not just the centralized cloud repository that allowed everyone access to the contracts, but advanced routing and redlining tools to make finding, editing and signing contracts easy for all who were collaborating on a given deal. 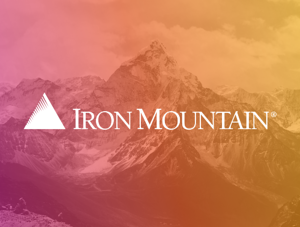 Iron Mountain had other specialized needs, too, such as integration with Freedom Scientific – a tool that enables visually-impaired employees to more easily interact with online tools. And like so many enterprises today, Iron Mountain saw itself eventually managing its sales relationships through Salesforce. So it needed a solution that could integrate easily with Salesforce when the time came to take that step. Iron Mountain knew what it needed; it was just a matter of finding a solution that had it all and could make good on the features that it promised. In April 2016, Iron Mountain launched SpringCM for its federal contracts. Iron Mountain quickly figured out the processes to best leverage their new, smart, centralized contract management solution. In the time since then, the investment has paid dividends. The success of SpringCM has been easy to quantify. Before SpringCM, the process of establishing or reviewing a contract with a federal client took days, if not weeks, to get through. With SpringCM in place, the same task takes only minutes or hours. And with a huge client base, that means a huge amount of time that Iron Mountain's contracting staff has gotten back in the past few years. The company has automated more than 4,000 workflows. And that has turned the contracting team from a team constantly flailing, searching and struggling under a mountain of paper into a strong, streamlined foundation for the whole federal division's expansion. Rather than burning time on busy work and still being unable to get ahead, the contracting team has become a model of efficiency. Without having to add a single new employee, the contracting team has been able to support a sales, operations and program management segment that has more than doubled in size. Automation has allowed the contracting team to be strategic in how they work. And the ripples of positive change throughout Iron Mountain's federal division have resulted in what feels like a whole new business – for employees, managers and clients. More businesses than ever are making use of Iron Mountain's array of storage services. From hospitals that need their X-rays securely backed up, to businesses leveraging their disaster recovery solutions to companies with critical media in antiquated formats like microfilm and microfiche, Iron Mountain has a place for all of it. And since the federal division implemented SpringCM, there's neither a regulatory hang-up nor a practical slowdown preventing any government client from taking advantage of what Iron Mountain has to offer. As Iron Mountain continues building its federal division, the company has even more tech-forward streamlining steps it plans to take. Iron Mountain has Salesforce integration in its future – and that is, of course, something that SpringCM can easily help to make happen. With SpringCM as a springboard, Iron Mountain can now reevaluate any and all of its business-critical IT operations – and find ways to do everything more effectively by using the right tools.